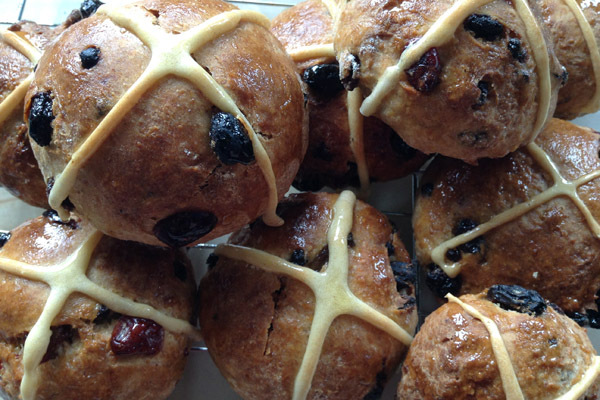 It’s time to welcome Easter with the sweet smell of freshly cooked Hot Cross Buns. We have made these deliciously zesty Hot Cross Buns in 9 easy steps, using a multi-functional KitchenAid Artisan Stand Mixer. Using a set of Cooking Scales, measure out all of your ingredients, this way they are easy to hand when you need them. Sieve 250g of Strong White Flour and 250 g of Wholemeal Bread Flour into the detachable stainless steel bowl provided with your KitchenAid Artisan Stand Mixer. Add the left over grains from the Wholemeal Bread Flour into the mixture. Then sprinkle the 7 g packet of yeast and 1 tsp of salt evenly within the bowl. Mix together delicately with a wooden spoon, this is to make sure that everything is equally combined. We always try our very best to keep all of our added ingredients locally sourced (but we know that it’s not always possible!). So, for our Hot Cross Buns we have chosen a locally produced Herefordian Cider; Bulmers Zesty Blood Orange (we have used a fruity cider to give our Hot Cross buns that extra little slice of flavour). Once you have measured out 150 ml of your chosen cider, make a tiny well in the middle of your mixture and slowly pour the cider into the centre. Mix all of the ingredients together using the Wire Whisk attachment on your KitchenAid Artisan Stand Mixer, and leave the mixture to sit for an hour on your kitchen side. Step 4: Time For The Fun and Easy Part! Once an hour has passed, add the 150 g of Dried Fruit, and 150 g of dried cranberries to the mixture. Remove the zest from your orange, and cut the orange in half (you will need the second half of the orange if you want to make the Sticky Sweet Glaze). Add half of the grated zest to the mixture, along with the fresh juice from one half of the orange. 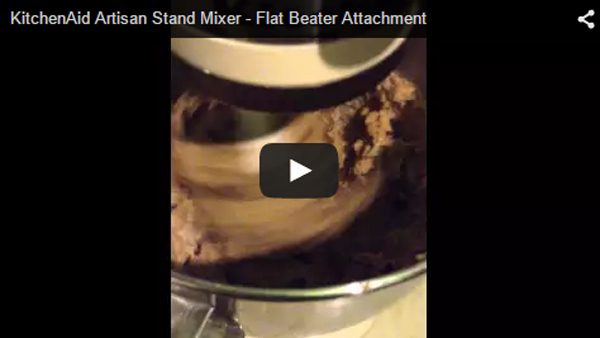 To combine the new added ingredients, attach the Flat Beater attachment to your KitchenAid Artisan Stand Mixer and set the speed to Number 1, turn on and mix for 2-3 mins maximum, so that all is now combined. Pour the Double Cream mixture into the KitchenAid stainless steel bowl with the rest of your mixture. For this part you will need to attach the Dough Hook (again, keeping the speed of your KitchenAid to a minimum) begin mixing until all of the mixture starts to form together to create a sticky dough substance. Now we need to wait for the dough to rise… You can either leave the dough, untouched; in a warm room overnight (if you do this make sure the dough is covered with a tea towel). With this option you will need to form the dough balls in the morning, don’t worry if a hard layer has formed on the top of the dough, this will easily dissolve when you are forming the dough. Or if you wanted to speed up the process, see below for an alternative quick paced option. If you have little time to spare, then this option will be the easiest for you. Start by forming the dough into your desired Hot Cross Bun shape and size, (don’t knead the dough too much as this will cause the dough to become tightly compact). Line 2 flat Baking Trays with Baking Parchment, and place the formed dough on the baking trays with an even amount of space apart (remember that the dough will expand a little in size whilst baking!). Place the trays into the pre-heated oven for an hour, this will cause your mixture to double in size. Now it’s time to bake the dough thoroughly at a very high temperature. Pre-heat your oven to 220°C/ Gas Mark 7, and cook the buns for 15-20 mins. When the buns are cooked, they should turn a golden-brown colour. Another way of checking if they are cooked inside, simply tap the bottoms of the buns, where they should make a hollow drumming sound. If you have a bit of a sweet tooth, then why not try your Hot Cross Buns with a sweet Honey and Orange glaze? Using a small Non-Stick Saucepan, add 1 tbsp of Honey, 1 tbsp of golden syrup and the juice of half an orange. Boil the ingredients to form thick syrup. Using a Pastry Brush, glaze all over the tops of the Hot Cross Buns and leave for a couple of hours for the glaze to set. 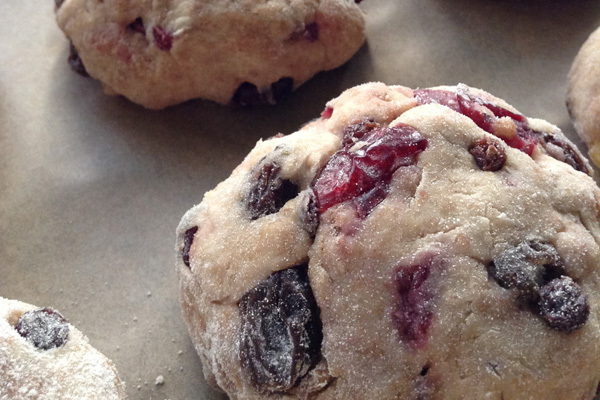 These Hot Cross Buns taste great with a sweet flavoursome jam, or a tangy chutney! Easter Baking, Hot Cross Buns, KitchenAid, KitchenAid Artisan Stand Mixer. Bookmark.